– J.D. Vance, JD, Yale Law School, author “Hillbilly Elegy” (2016, HarperCollins). Almost two decades ago when I was introduced as publisher and editor of an Adams County newspaper, a local attorney – who later became a good friend – called me “Hillbilly Ryan,” after learning that I wasn’t “imported” by the corporate conglomerate that, at the time, owned his community newspaper. When the late Roy Gabbert found out that I not only lived in Adams County – and still do, he also laughed when I passed his test of my local knowledge. (I knew both L.A. and Squirrel Town.) We did, however, have a brief feud over the existence of Neave, Ky. He doubted its existence, but with some help, proved himself incorrect (just that one time). Growing up in southern Highland County and living in upper Adams County, the term “hillbilly” was never taken as an insult. Not by me. And not by most of my friends and coworkers. Frankly, I’ve always preferred “ridgerunner” to “hillbilly,” but either way, when the work boots fit, I was taught to wear ‘em. Immediately, I appreciated this young man’s humor and humility. And I’m guessing he knows ginseng from pokeweed, to boot. After reading his 264-page memoir over a weekend, I also appreciated the character and perseverance of the man, who by age 31, had overcome incredible odds and obstacles, the majority of which were not of his making. Truth be told, they are anything but. They should be ordinary accomplishments, without question. Think about it. Isn’t the American Dream one that ensures any of us can grow up and achieve anything of our choosing through education and effort? Tell that to a southern Ohio hillbilly from a broken home with a drug addict (yes, of course, including heroin, as we see here on a daily basis) for a mother, no father, and a gun-toting grandmother who could cuss a sailor off of a submerged submarine. 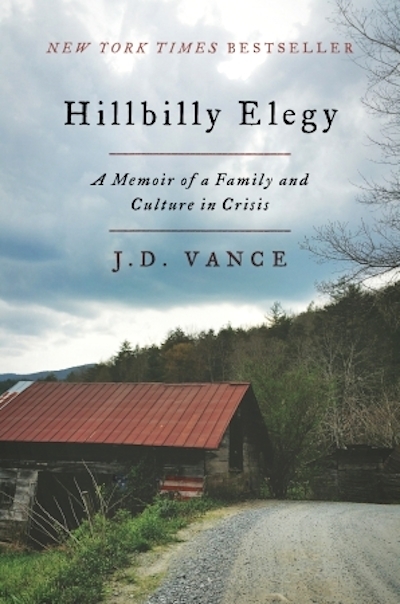 HarperCollins (https://www.harpercollins.com/9780062300546/hillbilly-elegy) describes Vance’s books as follows: “From a former Marine and Yale Law School graduate, a powerful account of growing up in a poor Rust Belt town that offers a broader, probing look at the struggles of America’s white working class, ‘Hillbilly Elegy’ is a passionate and personal analysis of a culture in crisis – that of white working-class Americans. The family’s path toward “upward mobility” was not an easy one. Many, if not most, of the author’s relatives veered off course. A few regained what sustainable traction they could. Yes, there are successes. But first, Vance walks the reader through the cultural norms of poverty, infighting (domestic violence), drug and alcohol abuse and low self-esteem. But it’s hard work. It takes commitment – and money. Instead of enrolling at Ohio State after high school, Vance enlisted in the Marines. He served four years, including a deployment in Iraq. “You’re too stupid for the Marines,” Mamaw told her grandson in one breath, followed by “You’re too smart for the Marines” in the next. The book is not without its painfully truthful political messages. Many of our readers and perhaps a few of our public officials in southern Ohio can relate to Vance’s personal account of growing up in a poor, economically depressed vacuum. (Vance also notes what, at least in part, creates those vacuums. See Armco Kawasaki (AK) Steel. Vance is brutally honest in sharing his story. He credits his extended family for his success. He also admits to distrusting those in government who might have removed him from his extended family when he most needed it. Thanks, Dr. Vance. I look forward to the second installment of your “memoirs.” And thanks to Highland County Press Designer and Editor Emeritus Lisa Wharton for sharing this book. • The book is available at: https://www.harpercollins.com/9780062300546/hillbilly-elegy or https://www.amazon.com/Hillbilly-Elegy-Memoir-Family-Culture/dp/0062300547. Mr. J.D Vance was on PBS Charlie Rose last night. Very interesting view points on the white working class which he mentioned several times. He also mentioned this is Trump's core support. But he will not vote for Trump. Looking forward to reading this as Charlie Rose stated the timing of this book is very relevant right now. This comment has been hidden due to low approval. I listened to the author on "The Tom Woods Show" and it seemed like a great book. This comment has been hidden due to low approval. Ruby Payne has also written about generational poverty as well. It's a vicious cycle and ain't easy to bust out of. Government programs provide a net but seldom a way out. A caring school, church, community and a strong willed individual - that's what it takes. But even then, the ingrained cultural norms often prevent escape. Great column and I plan on purchasing the book. This comment has been hidden due to low approval.